Powerful receiver for digital TV and Radio programs. Main features are a 4 00 MHz. The Dreambox DM800 HD se supports the Linux TV API. Plug & play slot for an internal 2,5 SATA hard disk. Enigma 2, Linux Operating System. Tuner: DVB-S, optional: DVB-C, DVB-T.
2 x Smartcard-Reader (Dreamcrypt CA). Mini USB for Service and software update. 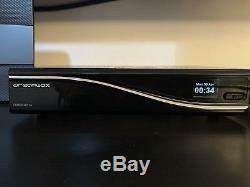 1 x Scart (RGB, FBAS or S-Video). 2 x USB 2.0 e. S/PDIF Interface for digital bit stream out (AC-3). 64 MByte Flash, 256 MByte RAM. SATA - for internal HDD 2,5. Unlimited channel lists for TV/Radio. Channel-change time < 1 second. Multiple LNB-Switching control (supports DiSEqC). OSD in many languages and skin-support. DreamBox DM800 HD se technical data. DBS-Tuner mit DVB-S2: Frequency Range 950.... 2150 MHz Demodulation DVB-S (QPSK); DVB-S2 (8PSK, QPSK) Symbol rate DVB-S: 2... 45 Mbaud/s, SCPC/ MCPC DVB-S2: 10 31 Mbaud/s (8PSK) , 10 30 Mbaud/s (QPSK). Video decoder: Video Compression MPEG-2 and MPEG-1 compatible, H.
264 Video Formats 4:3 / 16:9 Letterbox for 4:3 TV-Device. Audio decoder: Audiokompression MPEG-1 & MPEG-2 Layer I and II, MP3 Audio Mode Dual (main/sub), Stereo Frequency: 32 kHz, 44.1 kHz, 48 kHz, 16 kHz, 22.05 kHz, 24 kHz. Output analog: Output Level L/R 0,5 Vss on 600 Ohm THD > 60 dB (1 kHz) Crosstalk < -65 dB. Output digital: Output Level 0,5 Vss on 75 Ohm Sampled Data Filtering 32 kHz, 44.1 kHz, 48 kHz S/PDIF-Output optical, Toslink. Ausgang Video: Ausgangspegel FBAS 1 Vss +/- 0.3 dB an 75 Ohm. Video parameter: Input Level FBAS 1 Vss +/- 0.3 dB on 75 Ohm Teletext filter in conformity with ETS 300 472 Standard. TV-Scart: Output: FBAS, RGB, S-Video. Mini USB service connector: Function: Update of Firmware. Ethernet: 10/100 MBit compatible interface Function: Update of Firmware. Analoge modem: analoge modem for Internet connection. SATA Interface: for internal 2,5 HDD. USB 2 x USB 2.0. LNB power and polarisation per tuner: LNB Current 500mA max. Short-circuit-protected LNB Voltage vertical < 14V no load, > 11,5V at 400mA LNB Voltage horizontal < 20V no load, > 17,3V at 400mA. Count of active satellite position: DiSEqC 1.0/1.1/1.2 and USALS (Rotor Control). Power consumption: < 15W at 12V. External PSU Input: 110-240V AC / 50-60Hz / 0,6A Output: 12V = / 3,0A. Physical specification: Ambient Temperature +15°C... +35°C Humidity < 80% Size (W x D x H): 225 mm x 145 mm x 52 mm Weight: 940 g without HDD. 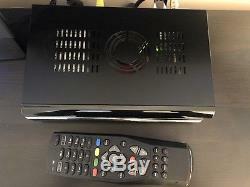 The item "GENUINE DREAMBOX DM800HD SE V2 SATELLITE TV RECEIVER SET TOP BOX" is in sale since Wednesday, May 9, 2018. 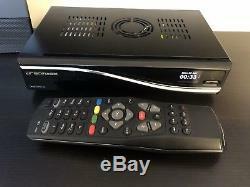 This item is in the category "Sound & Vision\TV Reception & Set-Top Boxes\Other TV Receivers/Reception". The seller is "pirriuk" and is located in London. This item can be shipped to United Kingdom, Austria, Belgium, Bulgaria, Croatia, Cyprus, Czech republic, Denmark, Estonia, Finland, France, Germany, Greece, Hungary, Ireland, Italy, Latvia, Lithuania, Luxembourg, Malta, Netherlands, Poland, Portugal, Romania, Slovakia, Slovenia, Spain, Sweden, Australia, Canada, Brazil, Japan, China, Israel, Hong Kong, Norway, Mexico, Singapore, South Korea, Switzerland, Thailand, South africa, Chile.